It's hard to keep a clean house when you have young kids. You want your kids to enjoy living in their own home, but that means messes will be made. You want to spend as much time as you can engaged with your kids and still have some time for your own pursuits, but that leaves little time for cleaning. So how do you do it? Step 1: Buy a second house. Step 2: Set it up all nice and pretty. Step 3: Don't ever go there. Don't have the money to do that? Me neither. So instead of driving myself crazy trying to clean up all the time, I am learning to let go. When I only had one child, and she still napped every day, it was easy to keep up. I used her nap time to reset the house. I tidied up the floors, straightened out the books on the shelves, folded laundry, did dishes. And I still had some time to do other things. When Louise stopped napping, I was eight months pregnant with Emmitt. That was when I officially lost control of neatness, over two years ago now. Maybe I will get it back some day, when my kids are all grown up. But our home is for living-in. And while the kids are little, living means playing. 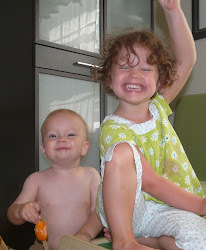 And playing means toys and books and games with hundreds of tiny pieces and dress-up clothes and food experiments. It gets messy. Quickly. I do the bare minimum of housework required to keep our apartment fit for playing and exploring and eating and sleeping. Which is probably even less than you think it is. It still does bother me at times, when my home is really messy, but I wouldn't trade the kids or the fun I have with them for a clean house. Although, if we ever get rich, I might just look into getting that second house. It could be nice. For now, I do not have a home that looks perfect. But my kids are happy. We have a lot of fun. And those are the most important things. How do you balance the housework and the kids? 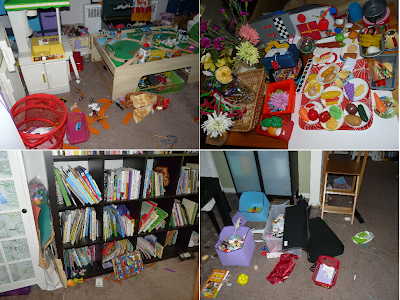 My kids are pretty helpful when it comes to keeping the place tidy, still chaos creeps up on us daily. Livingroom, kitchen & toilet are priorities and I tend to whisk round the playroom after they've gone to bed. Washing is always a nightmare. There are always piles in various stages of cleanliness and I've not put my ironing board away for who knows how long... But that's the hidden mess not many people see. My house has been driving me crazy lately, so when I saw the title of this post in my reader, I thought, "Oh, good, tips! I could use some of those." Then I read your steps. And I cracked up. So very, very true! I have not lost control of the neatness, because I never had control in the first place. I have no advice, because I can't seem to stay on top of cleaning no matter how much cleaning I do, but you know - we have fun! I homeschool as well. 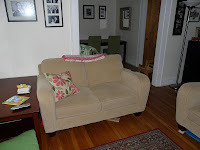 I try to tidy up while the kids are playing and keep the kitchen and livingroom tidy for dh. I keep water in the kitchen sink so that we can put our dishes there through out our day. The kids tidy their bedroom at night and I try to teach them to put things away when they are done with an activity. While dh was deployed, I used to clean 1 part of the house each evening while the kids were in the bath. I still pick up a lot after them, but limiting the toys or only adding on to the set makes it easier. Ie adding to his k'nex set sor Lego so that he can build more. It is easier to keep organized. I laughed long and loud at your 3 steps. :D Maybe now I should share them with my husband! Love love love this. I know one or two friends who are neatnicks and their houses are almost always clean and it makes me feel like such a slob. Our house isn't really dirty, just untidy. Some days more than others. I love reminders that my neatnick friends are likely the exception, not the rule! I would love to have a perfectly clean, tidy house all the time, but it's just not going to happen if I want to give my girls the attention they want. When my younger one is napping, I'm cuddling and giving my older one some one-on-one time. Sometimes my house is clean...and it usually lasts about half a day! I'm okay with that because as I look around I see so much evidence of *FUN* that I can't possibly complain. Thanks for the great giggle! My kids are grown and as of last Monday we're sorta empty nesters (one is away working before getting married) and the clutter is not toys anymore. It is "my projects"-sewing, books, etc. The best advice I got was from an 80yr.old woman of 6 boys. "You'll have plenty of time to keep the house immaculate later, enjoy the children now". I've realized that our house will/could be childless for more years than it was filled with kids and their life. One suggestion-our 'playroom' for the kids was the living room, it was suggested to me to have a box/basket behind the couch and toss the toys into it when you have visitors. It does work-as long as you have the room to have something behind the couch. My thing is a clean stove. The rest of the kitchen could be a battle zone but if the stove top is clean I'm ok in the morning when I walk into the kitchen. In other words, This too Shall Pass! I'm so glad I didn't waste any more time worrying about it than I did when the boys were younger! The Flylady. A system that works! Love it love it love it. CHAOS stands for "Cant Have Anyone Over Syndrome". Seriously, her system is worht a go - takes me about half an hour a day. My house is 1000% better than it was. And it incorporates fun stuff for the kids to do to help too. @Jane, Funny you should mention Flylady. I signed up for it (again) a few days after I wrote this post. I think it's an awesome system!